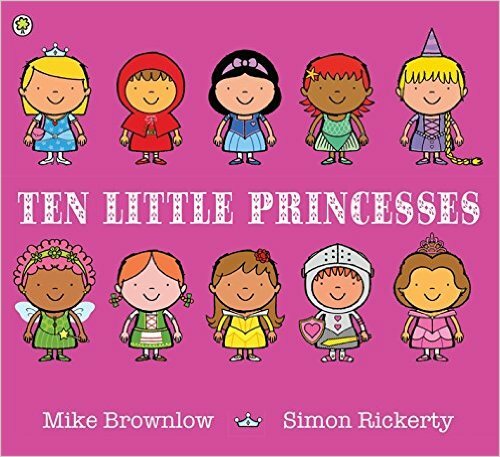 A perfectly princessy picture book with a super-special shiny pink cover! Ten little princesses going to the ball, Trotting on their ponies, past the castle wall. Are they looking for ward to their very special day? Ten little princesses all shout, "Yay!" Ten little princesses set off on a journey to a magical fairy tale ball. But on the way to the ball there's a dark and spooky forest, and a wicked witch, and a big bad wolf, and a sneaky troll, and a hungry giant! Will any of the little princesses get to the ball on time? Meet all your favourite fairy tale characters in this magical princess adventure: Little Red Riding Hood, Sleeping Beauty, Rapunzel, Snow White and more! With lots of things to spot and count on every page, this bouncy rhyming story from the creators of the award-winning, bestselling Ten Little Pirates is perfect for sharing again and again.